Star Wars Celebration 2019 is happening all this weekend - and by the end of it, we should know plenty more than we do now about Star Wars 9. But one of the biggest questions we've had for months is how the story could possibly include Princess Leia Organa following Carrie Fisher's passing in 2016 after Star Wars: The Last Jedi finished filming. 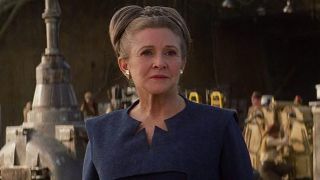 As Star Wars: The Rise of Skywalker director J.J. Abrams revealed today, Fisher will be posthumously reprising her iconic role in Episode 9 thanks to unused footage from Star Wars: The Force Awakens. Stephen Colbert, who hosted the big opening panel for Star Wars Celebration 2019, asked Abrams the question we were all thinking. "Even the little bit I knew Carrie Fisher, I know there's fundamentally no way to replace her as a person, or as that person playing the character of Princess Leia," said Colbert. "How did you approach filling the void left by Carrie in this movie?" "As I've said, we couldn't," Abrams replied. "She was the best. She was glorious. She was amazing. And we all just loved her. I knew her from many years before as well, [from] Episode 7; she was the greatest. It was impossible - there was no way. What are you going to do? You don't recast that part, and you don't suddenly have her disappear. The weird miracle of having had a number of scenes from Force Awakens that had gone unused, looking at those scenes and starting to understand that there was actually a way to use those scenes to continue her story, so that it would be her." Smartly, Abrams and co. knew that they didn't want to try and replicate Fisher with special effects, as had been done for Leia and Grand Moff Tarkin in Star Wars: Rogue One. "The idea of having a CG character was off the table; we never even want to try," he said. "And the idea of saying 'Well, what if we could actually write scenes around her? So it would be her performance, she's in the movie.'" "Every day, it hits me that she is not here. But it's so surreal, because we're working with her still, if that makes sense. She's in scenes, she's so alive in scenes - and the craziest part is how not crazy it feels. She is there in these scenes, in some scenes with Billie [Lourd], her daughter, who is in the movie as well. And it's just... Princess Leia lives in this film in a way that is kind of mind-blowing to me." Along with Episode 9, here are all the new Star Wars movies coming our way until 2021 and beyond. And check out the Ultimate Star Wars Timeline below.